Brushfire closes traffic near Ein Kerem; residents asked to evacuate due to smoke; Yad V'shem, Hadassah hospital close. The large brushfire near Jerusalem's Ein Kerem neighborhood has been contained, firefighters stated Wednesday night, but stated that firefighting would continue well overnight. "Much of the fire has been contained, and there are very few flashpoints left," Police Commissioner Yohanan Danino told Walla! News Wednesday. "There were several times over the past few hours where it looked like the fire would place several neighborhoods in danger, and in some cases even spread to homes." "Our target was to contain the fire and to return daily life to the region, to make sure it does not return, and to warn people not to return to high-alert areas until the electricity and water have been turned back on." Authorities are investigating several theories behind the cause of the blaze, according to the news outlet, including both arson and an unattended barbecue in the popular summer spot. Witnesses told Walla! News that a group of hikers were seen leaving a barbecue site shortly before the blaze broke out; an investigation later revealed that a pile of charcoal may not have been extinguished properly. Officials have not yet confirmed this as the definitive cause of the fire, however. Earlier, thirty-nine firefighters, several IDF units, volunteers from the Jewish National Fund (JNF-KKL) and six firefighting planes participated in efforts to control the fire. Residents of Blumenfeld, Levin, and Hanetka streets have been asked to evacuate immediately due to heavy smoke in the area. All roads near the fire are closed to motor vehicles. A total of twelve homes were damaged in Kiryat Hayovel and Ein Kerem, Fire Chief Captain Shahar Ayalon stated. Several people have also suffered light injuries from smoke inhalation. Yad V'Shem, the Holocaust Memorial museum and research center near Ein Kerem, was also evacuated, according to Walla! News. Yad Vashem spokesman Estee Yaariv confirmed to AFP Wednesday night that there had been no damage to any of its buildings. 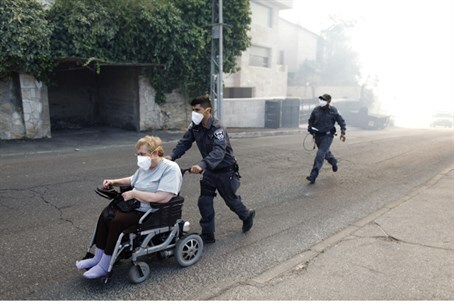 Hadassah Hospital is also being evacuated. The light rail has also been closed between Dania and Ein Kerem stations. All motorcycle and moped owners near the Jerusalem Forest have also been asked to move out of the area, for fear of exacerbating the blaze.